Tobia, A., et al. A Dental Crown for Patients with Schizophrenia. (2016) J Dent & Oral Care 2(2): 1-5. © 2016 Tobia, A. This is an Open access article distributed under the terms of Creative Commons Attribution 4.0 International License. Schizophrenia is a heterogeneous group of disorders with variable presentation in thought disturbances and bizarre behaviors (15). Psychological and behavioral hindrances in these patients affect concentration, perception, and ideation to the extent that social and occupational functioning is impaired (30). Symptoms range from hallucinations, disorganized thinking, distorted perception of reality, severe anxiety, difficulty performing work, and many others. This complex mental health disorder afflicts 1.1% (2.4 million) of U.S. population, which constitutes approximately 10% of the disabled (24, 28). Although schizophrenia affects men and women equally, the age of onset is typically between 18 to 24 in males and 24 to 34 in females (28, 30). Patients are usually treated with first- or second-generation antipsychotic medications (24). Long-term use of these medications is often required, in addition to continuous support of the caregivers and/or family members as about half of all people with schizophrenia have significant impairments in self-care skills. Schizophrenia is a heterogeneous group of disorders with variable presentation in thought disturbances and disorganized behaviors. Psychological and behavioral manifestations in patients affect concentration, perception, and ideation to the extent that social and occupational functioning is impaired. Symptoms include hallucinations, disorganized thinking, perceptual disturbances, severe anxiety, and difficulty completing tasks. This complex mental disorder afflicts 1.1% (2.4 million) of the U.S. population which constitutes approximately 10% of the disabled[3,4]. Although schizophrenia affects men and women equally, the onset is typically between 18 to 24 in males and 24 to 34 in females[2,4]. Patients are usually treated with first- or second-generation antipsychotic medications. Long-term use of these medications is often required in addition to continuous support from caregivers and/or family members as about half of all people with schizophrenia have significant impairment in self-care skills. Advanced dental disease seen in schizophrenia patients is due to several factors. The severe and persistent mental illness (SPMI) not only impairs the ability to carry out tasks for maintaining oral hygiene, but antipsychotic medication is known to produce adverse oral effects. Additionally, there are financial barriers to the access of dental care as well as an inadequate number of dentists comfortable with treating schizophrenia patients[5,6]. This paper addresses barriers to dental care by reviewing aspects of a dental crown that would promote oral health in individuals suffering from schizophrenia. Our paper is a literature review of research articles and online Medicaid health databases. The authors conducted searches in PubMed and MEDLINE and also retrieved information from a dental clinic and dental lab located in New Jersey. Searches were performed without restrictions on terms. Key terms used for searching included but were not limited to: schizophrenia, antipsychotic agents, health spending, schizophrenic Medicaid spending, dental crowns, crown flexural strength, dental restoration antibacterial activity. Schizophrenia is a chronic mental illness requiring long-term therapy with antipsychotic drugs often in combination with anticholinergic medication to reduce extrapyramidal side effects[1,7]. The anticholinergic medications may induce characteristic side-effects including decreased salivation, increased heart rate, dilated pupils, difficulty urinating, and constipation[1,8]. One symptom of particular interest for this review is hyposalivation caused by the blockade of parasympathetic stimulation of the salivary glands. This incidence leads to xerostomia (dry mouth) which provides a habitable environment for the bacteria that are known to cause various disorders such as halitosis, caries, gingivitis, glossitis, and oral ulcers[9,10]. Immunological and biochemical changes in the oral cavity increase susceptibility to infections. In short, schizophrenia patients are more prone to oral disease when compared to the general population. Medicaid is a federal social program for persons of all ages whose income and resources are insufficient to pay for healthcare. Prospective recipients include low-income adults, their children, and people with certain disabilities such as those afflicted with schizophrenia. In 1990, the total economic burden of schizophrenia in the U.S. was estimated at $32.5 billion of which $17 billion was spent on direct medical costs of caring for individuals with schizophrenia[6,11]. While this remains the most comprehensive and widely referenced study for the U.S., the estimated economic burden in 2002 was $62.7 billion and $155.7 billion in 2013. The majority of health services for these patients are paid through state Medicaid programs. A significant portion of these costs is associated with the use of prescription drugs and patient compliance with treatment. Active compliance to drug therapy was associated with higher healthcare costs compared to those who decided on no treatment. Regardless of higher costs, it is crucial that patients take doctor-recommended maintenance doses, as discontinuation causes relapse of symptoms and repeated hospitalizations[2,3]. Oral health support in particular is underestimated for individuals with schizophrenia. Despite the expenditures on medications and hospitalizations, costs toward dental services were less than 1% of total Medicaid spending. A prominent number of schizophrenia patients already lack the skills, dexterity, and motivation (anhedonia) to adopt and maintain good oral hygiene. Furthermore, Medicaid coverage of dental benefits differs from state to state and year to year (Figure 1). Research shows that dental services for schizophrenia patients were used less than the public and dental visits were fewer compared to groups of other mental illnesses[10,16]. The paucity of information on dental services for the mentally ill population signifies that this area is need of future research. 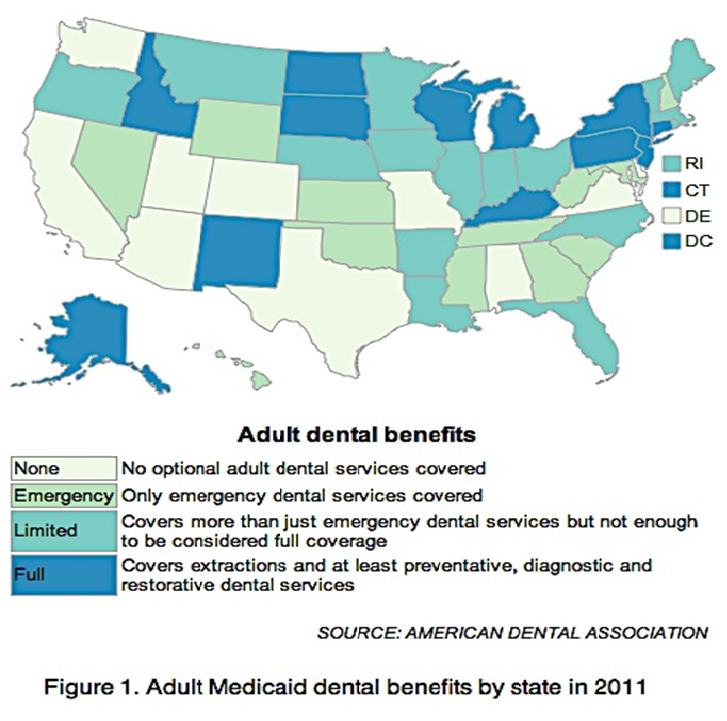 Figure 1: Adult Medicaid dental benefits by state in 2011. The economic burden is great for schizophrenia patients. Antipsychotic drugs constitute part of their medical expenditures and subsequently cause adverse orofacial effects. Despite the need for regular dental check-ups, many patients are unable to seek assistance and do not bother with dental visits until they encounter an acute oral episode. Data reveal that schizophrenia patients have higher scores for decayed and missing teeth and lower scores for filled teeth compared to age-matched controls. Dentists tend to extract problematic teeth in psychiatric patients instead of opting for restorative procedures[17,18]. Greater awareness and knowledge of oral health requires clinician guidance and monitoring of patients. While we do not endorse the proactive placement of dental crowns, an effective solution should include the choice of crown most cost-effective for this special population. Especially with such scant advantages in dental care, the implementation of a crown most suitable for schizophrenia patients has health and economic implications. Three qualities of different crown materials should be considered: antibacterial activity, flexural strength, and cost. Antibacterial activity of crowns is crucial because antipsychotic drugs are known to facilitate the growth of harmful bacteria in the oral cavity. A crown that can be used long term at the lowest cost is favorable for schizophrenia patients to reduce dental visits and prevent health care expenditure. Minimizing the possibility of crown replacement due to fragility is favorable in long term planning. Thus, cost and flexural strength, qualities most commonly compared between companies when advertising their product, were also investigated. A dental crown is a tooth-like cap placed over a damaged, decayed, or discolored tooth resulting from various factors such as grinding your teeth at night or overall poor hygiene. As long as the damage or decay is limited to within the borders of the enamel of the crown and hasn’t affected the nerves encased in the root, a dental crown is a practical solution to restoring a tooth’s function because it will fully cover the portion of the tooth visible above the gumline. During the procedure, the dentist will remove the damaged areas and file down the tooth into a cylindrical shape to leave some room for the crown. Impressions of the patient’s teeth are sent to a dental lab where the crown is created and sent to the dentist for cementation. The crown in effect restores the integrity, morphology, and function of the lost tooth. Three general types of crowns exist that are categorized according to their composition. Patients can choose between all metal, all porcelain (also known as all ceramic), and porcelain fused to metal (PFM). Metal crowns can be prepared from gold, nickel, and other metal alloys. While metals last the longest and are quite durable, they are not the most aesthetically appealing. Ceramic restorations are the most tooth-like but some are brittle and prone to fracturing. This option is the best in terms of color with many patients preferring the natural look. Finally, PFM crowns are a hybrid form of the metal and porcelain crowns in that they are composed of an inner metal covered with an outer ceramic body. Ceramic materials are subdivided into two general groups: glass ceramics (e.g. lithium disilicate) and high strength ceramics (e.g. zirconia). Glass ceramics have a composite structure consisting of inert oxides, such as metals and silica, and exist in a crystalline phase within a glassy matrix. Ceramics were not recognized as the durable type until the fabrication of high strength ceramics. In particular, yttrium oxide treated tetragonal zirconia polycrystals (YTZP), a tetragonal zirconia allotrope doped with yttrium, is a high strength ceramic because of the way it is transformed. Zirconia grains are heated to contraction and then cooled to a metastable phase at room temperature. A metastable state implies a long-lived but indefinite state because any external or environmental stresses like tension and grinding can trigger this tetragonal crystal to revert to a stable phase[21,22]. However, a 3 - 4% volume increase is associated with this reversion, which implies that as the grains increase in volume, further crack propagation is prevented[21,23]. Despite crack initiation, the two sides of the crack are brought together as individual grains and gain volume, resulting in a smaller furrow. The phenomenon is known as tension-induced transformation strengthening because of the use of transformation to strengthen the zirconia[24,25]. The biaxial flexure test is commonly used for determining strength with less variation in values. Older tests did not take into account that fractures are usually initiated at the edges of a dental crown, producing variation in strength values. The biaxial flexure test overcomes this flaw by measuring the strength of a sample placed on a circular arrangement of ball bearings. A piston concentric with the arrangement of balls supporting the sample applies a load from above. A drawback to this test is that it is most effective for flat polished surfaces, which is not an accurate portrayal of an actual tooth’s cusps and ridges. However, a material’s fracture toughness appears to be related to its sensitivity towards intricately fabricated surfaces[20,27]. The lithium disilicate glass ceramic has low fracture toughness and is thus dramatically weakened by a slight bump in a flat surface. Tougher materials like gold or zirconia are not affected by the shape of the surface. Tests permitted for measuring dental ceramic properties are established by national and international organizations. Such pre-designated tests increase reliability, keeping test results relatively consistent across studies, but deviation in reported values is inevitable. Strength of restorative materials has become a popular standard of comparison, especially with the rise in use of zirconia-based ceramics. Prior to the use of zirconia for dental restorations, the general order of decreasing strength was metal, PFM, then ceramic/porcelain. Clinical experience with all ceramic restorations breaking under occlusal load confirms that these materials are generally susceptible to stress corrosion and slow crack growth. Many highly aesthetic high strength ceramics are currently available on the market. Susceptibility to fracture of the brittle glass ceramic is no longer a drawback with the incorporation of computer-aided design and computer-aided manufacturing technology (CAD/CAM) for preparation of crowns from blocks of very durable ceramic materials such as alumina and zirconia. Surfaces of the oral cavity carry naturally occurring flora. Since the formation of biofilm is not restricted to our tongue and natural enamel, material that harbors fewer bacteria is an important factor to consider prior to crown placement. In one study, three-dimensional pictures viewed with confocal laser scanning microscopy (CLSM) were used to assess biofilm height. Biofilm on metals such as amalgam and gold was mostly dead (vital fluorescence [VF] technique < 8%) compared to ceramic which revealed biofilms containing highly vital microorganisms (VF = 34 - 86%). Bacteria count between gold crown surfaces and normal tooth surfaces were compared via DNA-DNA hybridization. Gold restorations had significantly less (71% reduction) bacteria than natural teeth, reaffirming the antibacterial property of restorative surfaces. Within the group of ceramics, Y-TZP zirconia revealed a very thin layer of biofilm while lithium disilicate had the thickest. In general, dental crown materials appear to have an antibacterial quality because of the reduced bacterial collection on their surfaces[34-36]. Various factors have been attributed to the reduction of biofilm on restoratives such as the low porosity of gold acquired through manufacturing as well as complementary electrical charges between bacteria and restoration materials. Additionally, hydrophobicity and greater surface roughness are associated with the propensity of plaque formation. A diverse collection of studies stress that understanding and manufacturing materials less prone to bacterial accumulation is an important part of clinical practice. Crowns could cost as low as $400 to $500 per tooth and as high as $2500 to $3000 per tooth. The range in price largely depends on the quality of composition and manufacturing of the product. Cost also depends on the experience of the dentist and the residential area of the patient. Metal crowns are produced from different metal alloys. Metals are classified into precious (high noble), semi-precious (noble), and non-precious (non-noble) based on the percentage of their noble metal (gold, palladium, and/or platinum). The percentage of noble metal is > 60%, > 25%, and < 25%, respectively. In general, the cost for a precious gold crown ranges from $700 to $1300, while a non-precious metal crown starts at about $600. Flexural strength, antibacterial activity, and cost were ranked for different restorative materials according to the evidence- based literature (Table 1). A value of 1 marks what is most favorable for each aspect of the crown for the schizophrenia patient*. However, the discrepancy in totals is not directly proportional to actual values (as some are actually a range of values and may overlap). The metal crown had the lowest number, or the best ranking, when the crown quality rankings were summed together. Glass ceramics ranked last, while PFM and high strength ceramics were intermediate. Taken together, a metal crown would be the most cost-effective (rank 1) while not sacrificing flexural strength (rank 2). While not the most aesthetically appealing, metal crowns further address the clinically significant issue of xerostomia and subsequent bacterial growth caused by medications used to treat schizophrenia (rank 1). Table 1: Types of Crowns Ranked Based on Certain Qualities. *1 = strongest, most antibacterial, lowest cost range. Medications used to treat schizophrenia have anticholinergic side effects resulting in decreased oral health and high Medicaid dental expenditures. While there is an evident correlation between these medications and oral health in schizophrenia patients, there is a lack of association of these variables to dental costs. The need for frequent dental visits is essential for the schizophrenia patient, but cost of dental care presents a barrier to healthcare. Unfortunately, state Medicaid regulations fund dental services at differing levels contributing to the poor oral hygiene of individuals afflicted with this severe and persistent mental illness. Based on a literature review of flexural strength, antibacterial activity, and cost of different types of crowns, metal crowns were deemed most favorable for a schizophrenia patient. Although the implementation of one noble metal crown would cost $700 - $1300 per patient, it has an average life span of 10 years. Regular preventive care is important, but a one-time placement of crowns or dentures made with strong resistant material and regular dental check-ups offsets the economic burden from untreated oral diseases. An investigation of the incidence of schizophrenia patients taking advantage of dental treatments (crown restorations in particular) in states with full Medicaid dental services would be the next step for prospective studies. Such research would provide a more accurate estimate and a more reliable comparison to patient hospital visits due to the consequences of preventable but untreated oral diseases. Early detection and prevention may contribute to a less economic burden; regular physical health monitoring protocols are only beneficial in the long run for all patients. 1. Friedlander, A.H., Marder, S.R. The psychopathology, medical management and dental implications of schizophrenia. (2002) J Am Dent Assoc 133(5): 603-610. 2. Martin, B.C., Miller, L.S. Expenditures for Treating Schizophrenia: A Population-Based Study of Georgia Medicaid Recipients. (1998) Schizophrenia Bulletin 24(3): 479-488. 3. Lang, K., Meyers, J.L., Korn, J.R., et al. Medication adherence and hospitalization among patients with schizophrenia treated with antipsychotics. (2010) Psychiatr Serv 61(12): 1239-1247. 4. Lyu, R.R., McCombs, J.S., Johnstone, B.M., et al. Use of conventional antipsychotics and the cost of treating schizophrenia. (2001) Health Care Financ Rev 23(2): 83-99. 5. Arnaiz, A., Zumárraga, M., Díez-Altuna, I., et al. Oral health and the symptoms of schizophrenia. (2011) Psychiatry Res 188(1): 24-28. 6. Rauchs, G., Fett, T., Munz, D., et al. Tetragonal-to- monoclinic phase transformation in CeO2-stabilised zirconia under uniaxial loading. (2001) J Eur Ceram Soc 21: 2229–2241. 7. Michalske, T., Freiman, S. A molecular interpretation of stress corrosion in silica. (1982) Nature 295: 511-512. 8. Lieberman, J.A.3rd. Managing anticholinergic side effects. (2004) Prim Care Companion J Clin Psychiatry 6(Suppl 2): 20-23. 9. Friedlander, A.H., Norman, D.C. Late-life depression: psychopathology, medical interventions, and dental implications. (2002) Oral Surg Oral Med Oral Pathol Oral Radiol Endod 94(4): 404-412. 10. Montejo, A.L. The need for routine physical health care in schizophrenia. (2010) Eur Psychiatry 2: S3-S5. 11. Ramon, T., Grinshpoon, A., Zusman, S.P., et al. Oral health and treatment needs of institutionalized chronic psychiatric patients in Israel. (2003) European Psychiatry 18(3): 101-105. 12. Dental Ceramic 1st edn. International standard 6872-1995. International Organisation for Standardization 1-14. 13. Wieselgren, I.M., Lindstrom, L.H. A prospective 1-5 year outcome study in first-admitted and readmitted schizophrenic patients; relationship to heredity, premorbid adjustment, duration of disease and education level at index admission and neuroleptic treatment. (1996) Acta Psychiatr Scand 93(1): 9-19. 14. Croghan, T.W., Johnstone, B.M., Buesching, D.P., et al. Information needs for medication coverage decisions in a state Medicaid program. (1999) Med Care 37(4 Suppl Lilly): AS24-AS31. 15. Cuckler, G., Martin, A., Whittle, L., et al. Health spending by state of residence, 1991-2009. (2011) Medicare Medicaid Res Rev 1(4). 16. Rice, D.P., Miller, L.S. The Economic Burden of Schizophrenia: Conceptual and Methodological Issues, and Cost Estimates. Handbook of Mental Health Economics and Health Policy–Schizophrenia. (1996) John Wiley & Sons 1: 321-334. 17. Griess, M., Reilmann, B., Chanavaz, M. Telescopic retained overdentres in mentally handicapped and schizophrenic patients – a retrospective study. (1998) European Journal of Prosthodontics and Restorative Dentistry 6(3): 91-95. 18. Ozcan, M., Cura, C., Valandro, L.F. Early bond strength of two resin cements to Y-TZP ceramic using MPS or MPS/4-META silanes. (2011) Odontology 99(1): 62-67. 19. Nielsen, J., Munk-Jørgensen, P., Skadhede, S., et al. Determinants of poor dental care in patients with schizophrenia: a historical, prospective database study. (2011) J Clin Psychiatry 72(2): 140-143. 20. Wagner, W.C., Chu, T.M. Biaxial flexural strength and indentation fracture toughness of three new dental core ceramics. (1996) J Prosthet Dent 76(2): 140-144. 21. Morrier, J.J., Barsotti, O., Blanc-Benon, J., et al. Antibacterial properties of five dental amalgams: an in vitro study. (1989) Dent Mater 5(5): 310-313. 22. Pak, H.S., Han, J.S., Lee, J.B., et al. Influence of porcelain veneering on the marginal fit of Digident and Lava CAD/CAM zirconia ceramic crowns. (2010) J Adv Prosthodont 2(2): 33-38. 23. Curtis, A.R., Wright, A.J., Fleming, G.J. The influence of simulated masticatory loading regimes on the bi-axial flexure strength and reliability of a Y-TZP dental ceramic. (2006) J Dent 34(5): 317-325. 24. Luthardt, R.G., Sandkuhl, O., Reitz, B. Zirconia-TZP and alumina- advanced technologies for the manufacturing of single crowns. (1999) Eur J Prosthodont Restor Dent 7(4): 113–119. 25. Meryon, S.D., Johnson, S.G. The modified model cavity method for assessing antibacterial properties of dental restorative materials. (1989) J Dent Res 68(5): 835-839. 26. Ban, S., Anusavice, K.J. Influence of test method on failure stress of brit- tle dental materials. (1990) J Dent Res 69(12): 1791-1799. 27. Savitt, E.D., Malament, K.A., Socransky, S.S., et al. Effects on colonization of oral microbiota by a cast glass-ceramic restoration. (1987) Int J Periodontics Restorative Dent 7(2): 22-35. 28. Albakry, M., Guazzato, M., Swain, M.V. Fracture toughness and hardness evaluation of three pressable all-ceramic dental materials. (2003) J Dent 31(3): 181-188. 29. Harrow, M., Jobe, T.H. Factors involved in outcome and recovery in schizophrenia patients not on antipsychotic medications: a 15-year multifollow-up study. (2007) J Nerv Ment Dis 195(5): 406-414. 30. McFarland, B.H., Collins, J.C. Medicaid cutbacks and state psychiatric hospitalization of patients with schizophrenia. (2011) Psychiatr Serv 62(8): 871-877. 31. Auschill, T.M., Arweiler, N.B., Brecx, M., et al. The effect of dental restorative materials on dental biofilm. (2002) Eur J Oral Sci 110(1): 48-53. 32. Goodson, J.M., Shoher, I., Imber, S., et al. Reduced dental plaque accumulation on composite gold alloy margins. (2001) J Periodontal Res 36(4): 252-259. 33. Bremer, F., Grade, S., Kohorst, P., et al. In vivo biofilm formation on different dental ceramics. (2011) Quintessence Int 42(7): 565-574. 34. McCombs, J.S., Nichol, M.B., Stimmel, G.L., et al. Use patterns for antipsychotic medications in medicaid patients with schizophrenia. (1999) J Clin Psychiatry 19: 5-11. 35. Mitov, G., Heintze, S.D., Walz, S., et al. Wear behavior of dental Y-TZP ceramic against natural enamel after different finishing procedures. (2012) Dent Mater 28(8): 909-918. 36. Salsberry, P.J., Chipps, E., Kennedy, C. Use of general medical services among Medicaid patients with severe and persistent mental illness. (2005) Psychiatr Serv 56(4): 458-462. 37. Larsson, K., Glantz, P.O. Microbial adhesion to surfaces with different surface charges. (1981) Acta Odontol Scand 39(2): 79-82. 38. Al-Marzok, M.I., Al-Azzawi, H.J. The effect of the surface roughness of porcelain on the adhesion of oral Streptococcus mutans. (2009) J Contemp Dent Pract 10(6): E017-E024. 39. Bobetsis, Y.A., Barros, S.P., Offenbacher, S. Exploring the relationship between periodontal disease and pregnancy complications. (2006) J Am Dent Assoc 137 Suppl: 7S-13S.